The 10U is mainly controlled by the Bluetooth Handlebar Remote. The two are paired from the factory and are ready for immediate use. 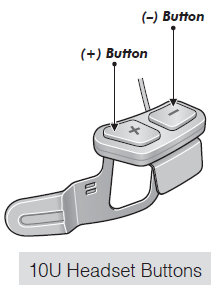 If the Handlebar Remote runs out of battery, you can use the headset buttons to operate all functions. 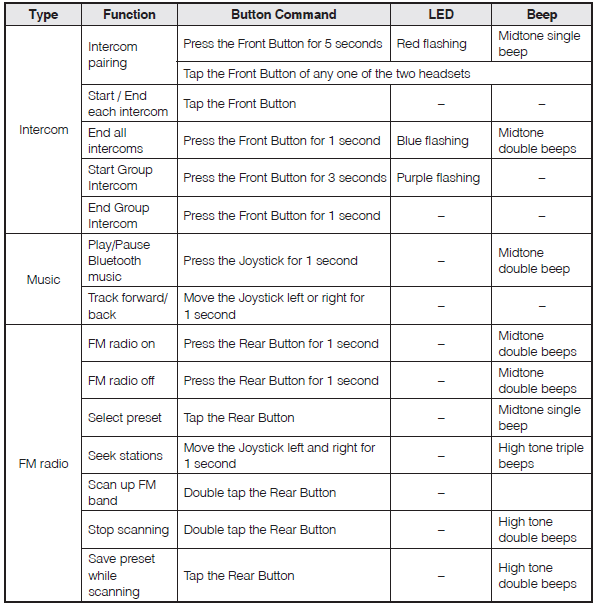 The headset button operation guide is explained in tables at the end of each section. You can look up the package content on the 10U in the following link. 1. Turn on the headset and press the Joystick for 5 seconds until the LED flashes red and blue alternately and you hear multiple beeps. 2. Within 2 seconds, tap the Front Button again, then the LED flashes red and you hear “Media selective pairing”. 3. Search for Bluetooth devices on your smartphone. Select the Sena 10U in the list of devices detected on your phone. 2. Within 2 seconds, tap the Rear Button again, then the LED flashes blue and you hear “Phone selective pairing”. 1. When you have an incoming mobile phone call during an intercom conversation, you will hear a ring tone. You can choose whether to 1) answer the mobile phone call and stop the intercom conversation, or 2) reject the phone call and stay on the intercom conversation. a. To answer the phone call and stop the intercom conversation, tap the Rear Button or the Front Button. The VOX Phone feature does not work if you are connected to the intercom. When you hang up the phone call, the intercom will automatically be recovered. b. To reject the phone call and stay on the intercom conversation, press the Front Button for 2 seconds until you hear a beep. Unlike other motorcycle Bluetooth headsets, this prevents a user from being dropped out of an intercom conversation by an incoming mobile call. 2. When you have an incoming intercom call during a mobile phone call, you will hear 4 high toned beeps, alerting you that there is an incoming intercom call. You will also hear a voice prompt, “Intercom requested”. In this case, the intercom call does not override the mobile call because intercom has lower priority than mobile call. You have to hang up the mobile phone call to make or receive an intercom call. 3. 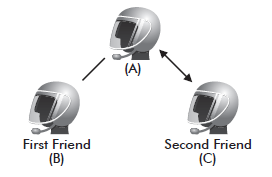 You can have a three-way conference phone call by adding an intercom friend to the mobile phone conversation. During a mobile phone conversation, tap the Front Button to invite one of the intercom friends to the mobile phone line. To disconnect the intercom first and go back to your private mobile phone call, terminate the intercom by tapping the Front Button. To end the mobile phone call first and maintain the intercom conversation, tap the Rear Button, press the Front Button for 2 seconds, or tap the Front Button, or wait for the person on the mobile phone line to end the call. 1. To pair the second mobile phone, press and hold the Front Button for 5 seconds until the red LED flashes red rapidly and you hear voice prompt, “Intercom pairing”. 2. Within 2 seconds, tap the Rear Button again, then the LED flashes blue rapidly and you will hear a voice prompt, “Second mobile phone pairing”. 3. Search for Bluetooth devices on your mobile phone. Select the Sena 10U in the list of the devices detected on the mobile phone. 5. The mobile phone confirms that the pairing has completed and the 10U is ready to use. You will hear a voice prompt, “Your headset is paired”. 2. You have to use a motorcycle specific GPS, which transmits turn-by-turn voice instructions to the headset by Bluetooth. Most automotive GPS systems do not have this feature. 3. The Sena SR10 is a Bluetooth two-way radio adapter for group communication, and uses Hands-Free Profile. The incoming audio from the two-way radio via SR10 is heard in the background while having an intercom conversation or a mobile phone call. 4. The GPS navigation or a radar detector could be connected to the SR10 by wire. The GPS voice instruction or the radar detector alarm is also heard in the background via SR10 while having an intercom conversation or a phone call. Please refer to the SR10 User’s Guide for details. You may make a four-way Universal Intercom connection with a couple of different configurations, 1) three 10Us and one none-Sena Bluetooth headset or 2) two 10Us and two non-Sena Bluetooth headsets. 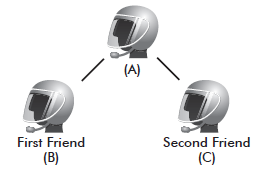 You may have a couple of other Four-way Universal Intercom configurations, 1) your headset (A), a non-Sena Bluetooth headset (B), another 10U (C), and a non-Sena Bluetooth headset (D), 2) your headset (A), a non-Sena Bluetooth headset (B), and two other 10U headsets (C and D). You may make the four-way Universal Intercom call the same way as a normal four-way intercom call. connection is made again automatically so that you can use a mobile phone call function. 1. 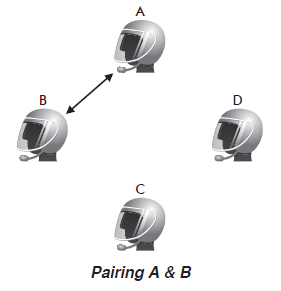 You (A) need to be paired with a non-Sena Bluetooth headset (B) and another 10U headset (C) for the three-way conference intercom. 3. The other 10U (C) may join the intercom by making an intercom call to you (A). 4. 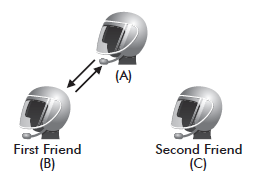 Now you (A), non-Sena Bluetooth headset (B), and the other 10U (C) are having a three-way conference intercom. You can start an intercom conversation with one of any intercom friends by tapping the Front Button: Tap the Front Button once to intercom with the first intercom friend, tap the Front Button twice to intercom with the second intercom friend, and tap the Front Button three times to intercom with the third intercom friend. 1. 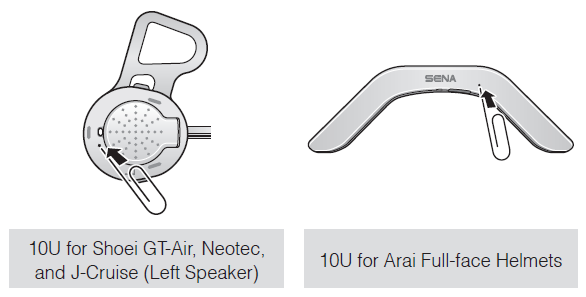 If a non-Sena headset does not support a multipoint connection, it cannot use a phone call connection while using the Universal Intercom. 2. 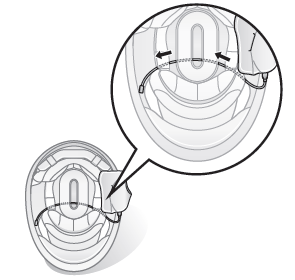 As for Sena headsets, the Universal Intercom affects the multipoint connection. 3. 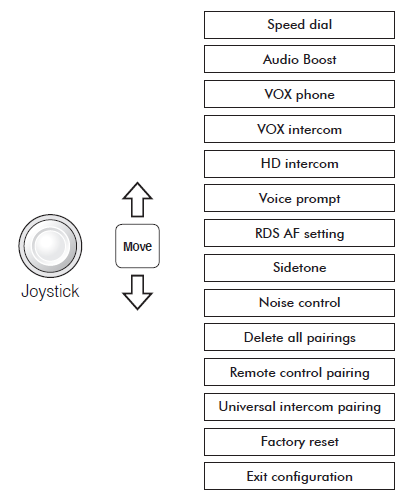 If non-Sena headset (already paired as Universal Intercom with Sena) is turned on, then the multipoint connection is automatically deactivated. 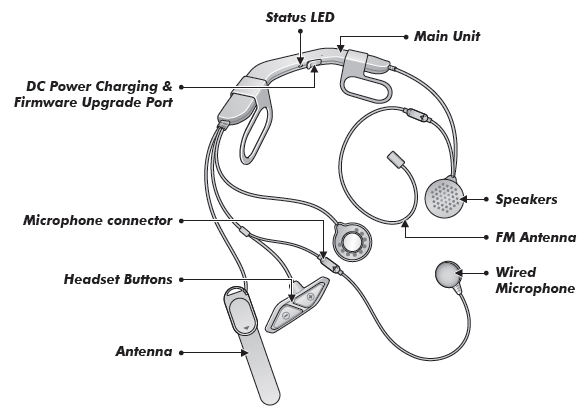 And the non-Sena headset is automatically connected to the Sena headset as a Universal Intercom. So you cannot use multipoint connection device such as GPS, while a non-Sena headset is turned on. 4. Even though you disconnect the non-Sena headset as a Universal Intercom, it will not automatically restore the multipoint connection. To restore the multipoint connection, you should turn off the non-Sena headset first, then try to connect to multipoint device manually from the device screen or simply reboot the device so that it automatically connects to the Sena headset. 2. Press the Front Button for 3 seconds to begin Group Intercom. The LED will flash purple and you will hear a voice prompt, “Group intercom”. 3. To terminate Group Intercom, press the Front Button for 1 second or tap the Rear Button during Group Intercom. You will hear a voice prompt, “Group intercom terminated”. This video explains how to use Intercom features with the 10U. You can listen to the radio during the intercom conversation. 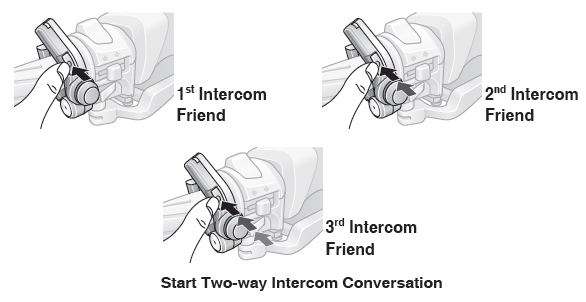 To start FM sharing, press and hold the (-) Button for 1 second during the intercom conversation. During FM sharing, you can move to the next preset station and you or your friend on the intercom can change frequencies. If either person changes the frequency, the other will listen to the same frequency. To terminate FM sharing, press and hold the (-) Button for 1 second or end the intercom call. 1. FM sharing will be terminated if the headset starts a multi-way intercom conference. 2. When Audio Multitasking is enabled, if an intercom call is made while you are listening to the FM radio, FM sharing will not work. 3. FM Sharing is only supported between Sena headsets that currently support this feature. With the temporary preset function, you may temporarily preset stations automatically without changing the existing preset stations. Tap the Rear Button three times to automatically scan for 10 temporary preset stations. The temporary preset stations will be cleared when the system is powered off. RDS AF allows a receiver to re-tune to the second frequency location when the first signal becomes too weak. With RDS AF enabled on the receiver, a radio station with more than one frequency can be used. You can change this setting using the Sena Smartphone App. When the 10U is not working properly or is in faulty status for any reason, you may reset by pushing the pin-hole reset button as shown in the picture below. 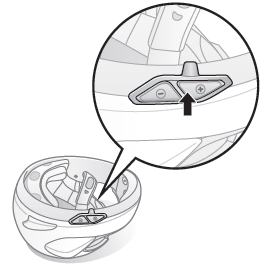 Insert a paper clip into the reset pin-hole and press the reset button for a second with light pressure. The 10U will be switched off. Restart the system and try again. This will not restore the headset to factory default settings. Go to the configuration menu. To delete all Bluetooth pairing information of the 10U, move the Joystick up or down until you hear a voice prompt, “Delete all pairings”, and tap the Rear Button to confirm. If this feature is enabled, you can initiate an intercom conversation with the last connected intercom friend by voice. When you want to start intercom, say a word such as “Hello” loudly or blow air into the microphone. If you start an intercom conversation by voice, the intercom terminates automatically when you and your intercom friend remain silent for 20 seconds. However, if you manually start an intercom conversation by tapping the Front Button, you have to terminate the intercom conversation manually. However, if you start intercom by voice and end it manually by tapping the Front Button, you will not be able to start intercom by voice temporarily. In this case, you have to tap the Front Button to restart the intercom. This is to prevent repeated unintentional intercom connections by strong wind noise. After rebooting the 10U, you can start intercom by voice again. This feature is disabled by default. You can enable this feature using the Sena Smartphone App. This feature is enabled by default. You can disable this by using the Sena Smartphone App. To enable Audio Boost, use the Sena Smartphone App. If this feature is enabled, you can answer incoming calls by voice. When you hear a ringtone for an incoming call, you can answer the phone by saying a word such as “Hello” loudly or by blowing air into the microphone. VOX Phone is temporarily disabled if you are connected to intercom. If this feature is disabled, you have to tap the Rear Button or the Front Button to answer an incoming call. This feature can be disabled/enabled using the Sena Smarphone App. 1. To enter into the voice speed dial menu, double tap the Rear Button and you will hear a mid-toned single beep and a voice prompt, “Speed dial”. 2. Move the Joystick up or down to navigate between the menus. You will hear prompts for each menu item. 4. After selecting the last number redial menu, you will hear a voice prompt, “Last number redial”. Then, to redial the last phone call number, tap the Rear Button. 5. To call one of the speed dials, move the Joystick up or down to navigate between the menus until you hear a voice prompt, “Speed dial (#)”. Then, tap the Rear Button. 6. If you want to exit the speed dial immediately, move the Joystick up or down until you hear voice prompt, “Cancel”, and tap the Rear Button. If you do not press any button within 15 seconds, the 10U will exit the voice speed dial menu and go back to stand-by mode. 1. Make sure that you connect the mobile phone and the headset to use the speed dial function. 2. You need to assign speed dial numbers before using the speed dial (please refer to section 14.1, “Assigning Speed Dial”). 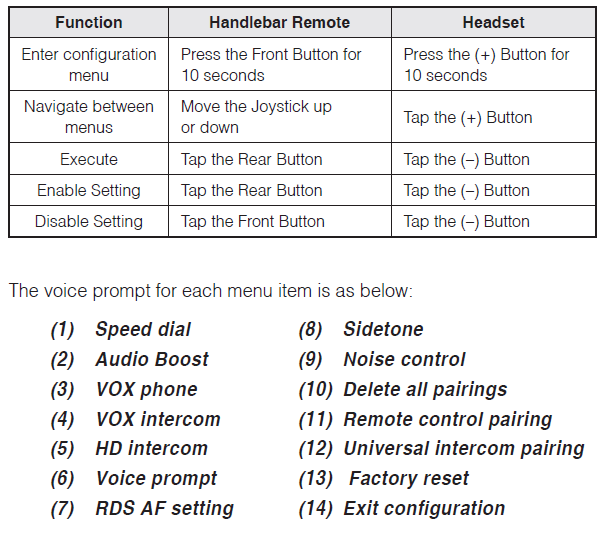 You can set the configuration of the 10U by the voice menu instruction described below. 1. To enter into voice configuration menu, press and hold the Front Button for 10 seconds until the LED shows solid blue and you hear high toned double beeps. You will also hear a voice prompt, “Configuration menu”. 2. Move the Joystick up or down to navigate between the menus. You will hear voice prompts for each menu item as below. 3. You can enable the feature or execute the command by tapping the Rear Button, or disable the feature by tapping the Front Button. 4. 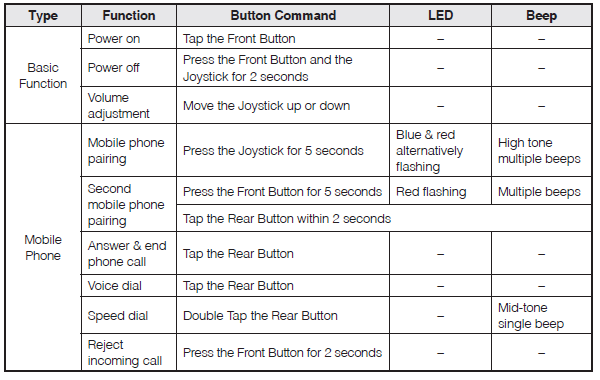 If any button is not pressed within 10 seconds, the 10U will exit the configuration and go back to stand-by mode. 5. If you want to exit the configuration immediately, move the Joystick up or down until you hear a voice prompt, “Exit configuration”, and tap the Rear Button. 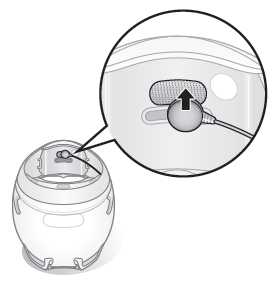 This installation guide is based on Arai RX7-RR5. 1. Before you install the 10U, remove the cheek pads and the neckroll. 2. 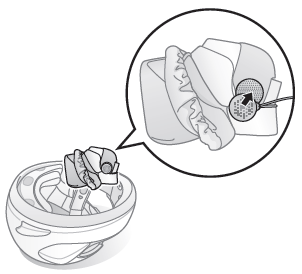 Insert the main unit between the external shell and the inner shell. main unit to the helmet. 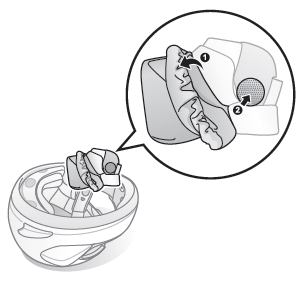 for microphone and attach it on the inside of the helmet's chin guard. the microphone cable into the microphone connector. speakers on the corner of the ear pocket. process for the other cheek pad. 9. Reinstall the cheek pads and the neckroll. 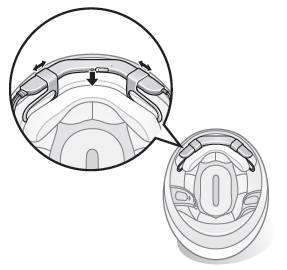 Arai Helmets that are Compatible with the 10U for Arai Full-Face Helmets. 10U - Fitting other helmets besides what is specified on the box. Currently the 10U System is available in 5 different models for the Shoei GT-Air, Neotec and J-Cruise, Schuberth C3/C3 Pro, and Arai full-face helmets, with more to come in the future. These available versions of the 10U will only fit in these specific helmets as they were designed specifically for them. The Sena Smartphone App allows you to configure device settings andview the User’s Guide and the Quick Start Guide. Pair your phone with your 10U headset (please refer to section 5.1 “Mobile Phone Pairing Mobile Phone, Bluetooth Stereo Device”). Run the Sena Smartphone App and you can configure its settings directly from your smartphone. You can download the Sena Smartphone App for Android or iPhone from www.sena.com/headset-app/. The 10U supports firmware upgrades. You can update the firmware using the Sena Device Manager. Please visit Sena Bluetooth website at www.sena.com to check the latest software downloads. 10U - Handlebar Remote is included in the Package and can be sold separately. No. 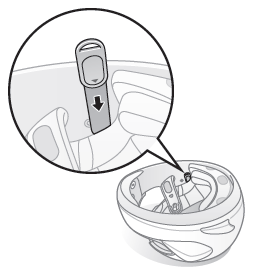 The Handlebar Remote is included in the package with the 10U to allow riders to control the headset with the need to lift up their visor. 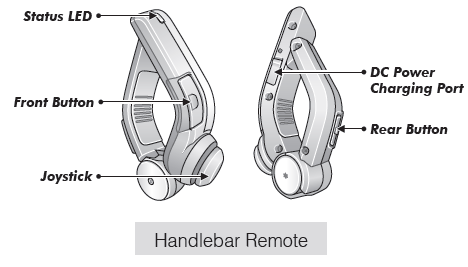 However, the Handlebar Remote can be purchased separately as an additional accessory for the 10U. of the audio in the foreground will also increase or decrease the volume of the overlaid audio in the background. The volume of the foreground audio can be adjusted using the headset. How much background audio that is heard can be adjusted using the Sena Smartphone App. HD Intercom, HD Voice and Audio Source Priority become disabled temporarily when Audio Multitasking is enabled. * Two audio sources in the foreground can be heard simultaneously with the same volume level. ** Only one background source can be heard at a time while listening to an audio source in the foreground. audio sources can be adjusted using the headset. B. GPS app directions will be heard in the background during intercom conversations. C. The FM radio will be heard in the background when GPS instructions are heard. 1. Audio Multitasking will be activated during two-way intercom conversations with a headset that also supports this feature. 2. When Audio Multitasking is disabled, the background audio source will return to its independent volume level. 3. For Audio Multitasking to work properly, you need to power the headset off and on. Please restart the headset. 4. Some GPS devices may not support this feature. The Background Volume can be adjustable only when the Audio Multitasking turns on. Level 9 is the highest volume and 0 is the lowest.